Every time I make this guacamole I get asked for the recipe. It’s a very straight forward recipe that you can’t go wrong with. I found it in the pink plaid Better Homes and Gardens cookbook that I received not long after getting married and if you look at the page it’s on you will see lots of smudges and stains on it, the sign of a good tried and true recipe! I’m sure there are plenty of ways to make guacamole out there, but for some reason I just haven’t strayed from this one. If you are intimidated by cutting up an avocado don’t be. Watch this video and try it out. Once you do it a couple of times you’ll be a pro. I always squeeze the lime juice over the avocado immediately after I cut it to avoid it becoming brown. If you have trouble knowing how to pick out a nicely ripe avocado at the grocery store, don’t be afraid to ask for help. The produce guy at my Publix knows me by name now, he’s always helping me out when it comes to picking out fruit like avocados (and cantelopes!) since I’m always worried about coming home to an over ripe or under ripe one that I can’t use. Serve this up at your next get together with a couple of your favorite salsas and some good tortilla chips. My favorite salsas to serve with this are Pace Salsa Verde (has a kick and is soooo good! ), Jack’s Fresh Salsa, or mango salsa from Costco. Aggie’s Kitchen will be closed for vacation till next week…but no worries, we’ve got a couple guests stopping by to share some recipes with you! I’ll be hanging with the fam in beautiful Marco Island, FL…keep up with us (and what we are eating!) on Aggie’s Kitchen on Facebook! Combine all ingredients into a bowl. Smash avocado with fork, mix to combine. I usually leave mine a little chunky, but mixed well. Next Post » Picky Palate is here…with Ice Cream Chocolate Chip Cookies! ooh this sounds great! Ive never thought to include chiles – great idea! I use the same recipe from the pink plaid B & G cookbook. I think you told me this was the one you use so I use it all the time too. I was always afraid of cutting an avocado until I saw it done a million times on Food Network. It is really easy to do once you try it. But I love this guacamole. When I don’t have any diced green chiles, I use a few splashes of hot sauce. I remember showing you the recipe for one of our get togethers! This is the same one. Sometimes I substitute fresh chopped jalapeno instead of the chilies, but for some reason I like the chilies better. This stuff is so addicting! Even Gina loves it now! 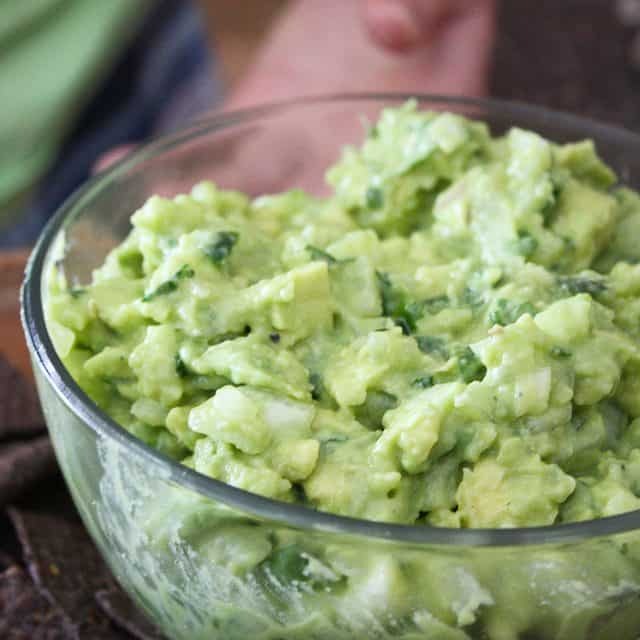 it took me all these years to love guac… thank you for this yummy version! I love guacamole! Can’t wait to give your recipe a try soon. It took me forever to appreciate the flavor or avocados and now I can’t get enough! Great looking guacamole recipe! your guacamole looks really yummy! Noting beats a good guacamole! Mmm. One of my favorite snacks/appetizers! Oh, Making this again for family gathering for this weekend… It is requested every time!!!! Love it!! We call this recipe, ol’ Reliable! So fresh, and just perfect guacamole. We do add a sprinkle of salt as well. Thanks Aggie, this guacamole recipe is the best!